In Bangalore there was a shopping mall where in the cafeteria we used to get this wonderful Egg Chicken Mughlai Paratha directly as if transported from Kolkata. It was undoubtedly a Bengali food outlet catering to the gastronomic fancies of bongs living outside their hometown. We were quite frequent there many a time fulfilling our appetite with luchi alu dum, egg roll, chicken roll, vegetable chop and last but not the least with Mughlai parathas. The tough crispy exterior of the Mughlai paratha falling apart as you lay your fingers on it with the mushy chicken stuffing melting in your mouth makes eating a tantalizing experience. 1) Mix in all-purpose flour and whole wheat flour. Add a pinch of salt and milk. When the milk absorbs in the flour completely, using required amount of water knead soft dough. 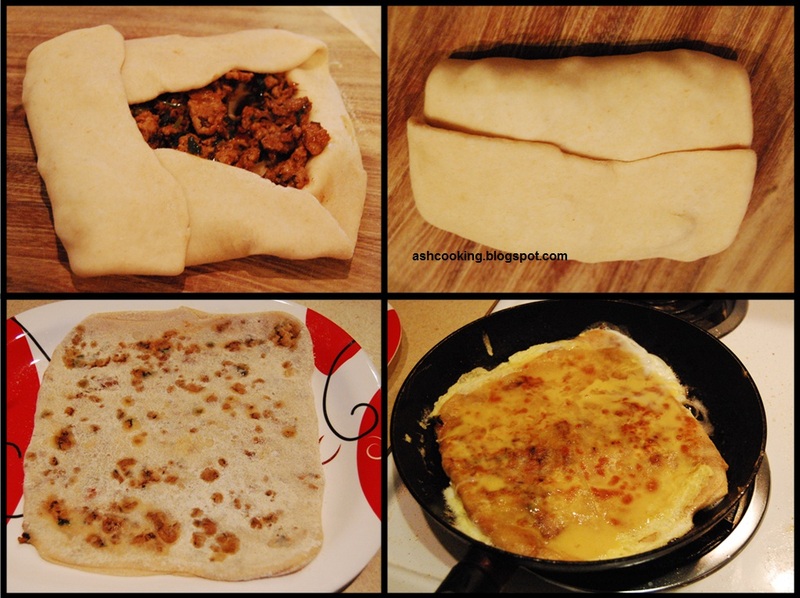 Once dough is made, keep it covered for a while as you go about preparing the stuffing. 2) Heat oil in a skillet. Add cumin seeds into the smoking hot oil and allow them to sizzle. Then add onion and green chillies. Shallow fry till onion turns golden brown in color. Add ginger-garlic paste and stir in. Add the minced chicken and properly mix in. 3) Now add the spices - turmeric powder, kashmiri red mirch, cumin powder, coriander powder, garam masala powder and salt. Blend the spices well into the chicken and let the chicken be browned a bit on medium heat, stirring sporadically. 4) Toss in the chopped tomatoes and cook till tomatoes soften and integrate into the mixture. 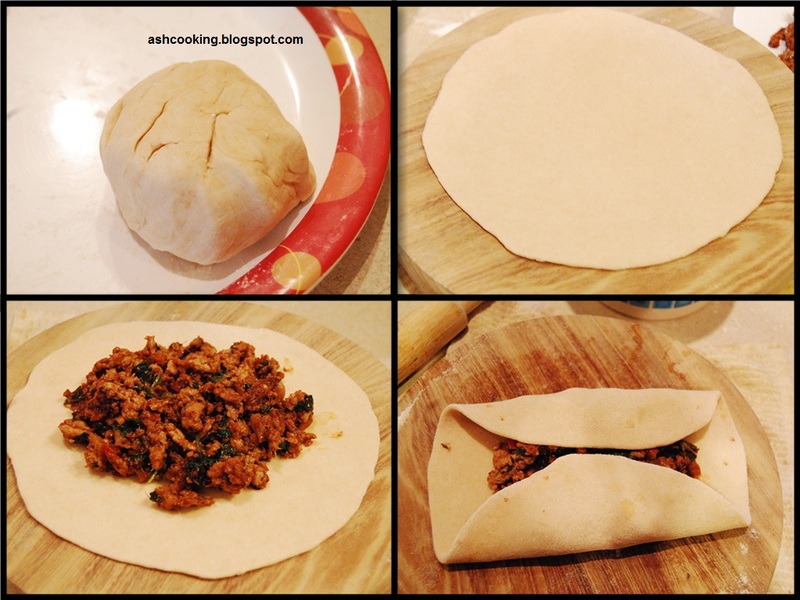 Finally, fold in the coriander leaves before turning the flame off. Stuffing is ready. 5) Make medium sized balls out of the dough. Roll the balls out into circular shape pancakes of 7 inches in diameter. Place the stuffing in the middle of the pancake and folding the sides as demonstrated in the pics below, work them into square shapes. Dust them with flour while rolling them out into the size of parathas. 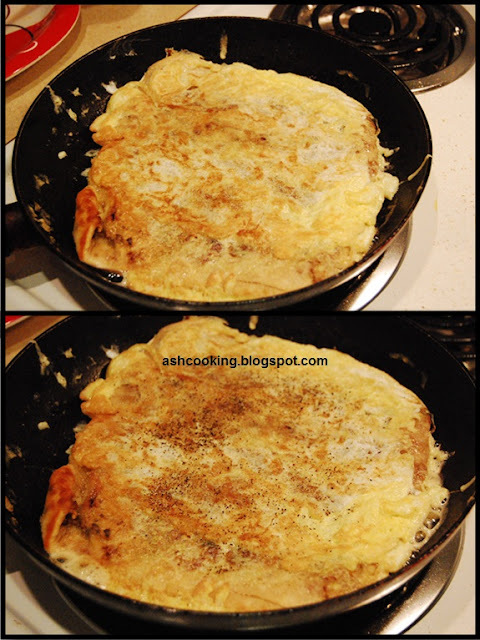 6) Heat oil in a non-stick skillet; place the parathas in the semi hot oil. 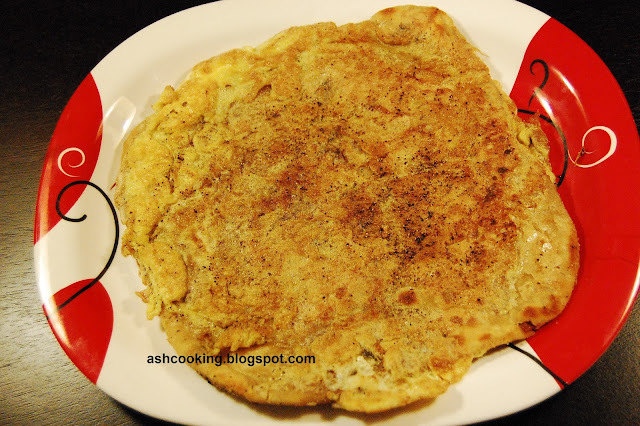 Brush the visible side of the paratha with spoonful of beaten eggs. Flip it over and repeat the same. 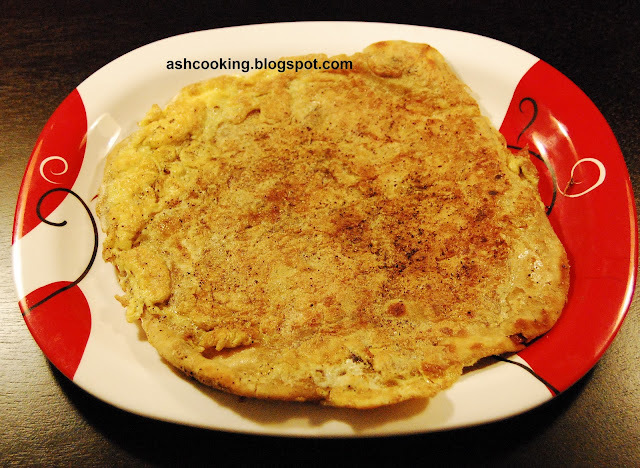 Fry the parathas till eggs on both sides are cooked. Sprinkle salt and black pepper powder on the parathas while frying. 7) Serve hot with tomato ketch up.